Last year I decided I wanted to do something called the One Hundred Strangers project. I stumbled across it on the Flickr website. They suggested it as a way to help improve your portrait taking skills. By October 2013 there were more than 9,000 members on the project and over 40,000 photographs posted. I'm sure it's well beyond that now. The only real "rule" is that you must have the permission of the subject. While spending time in the Far East (of Canada) with my father, I was able to wander through downtown Oxford. It's a very small town in the northwest arm of Nova Scotia with a population of about 1,100 people. This is where my parents were living when I was born Springhill, Nova Scotia the place with the closest hospital. 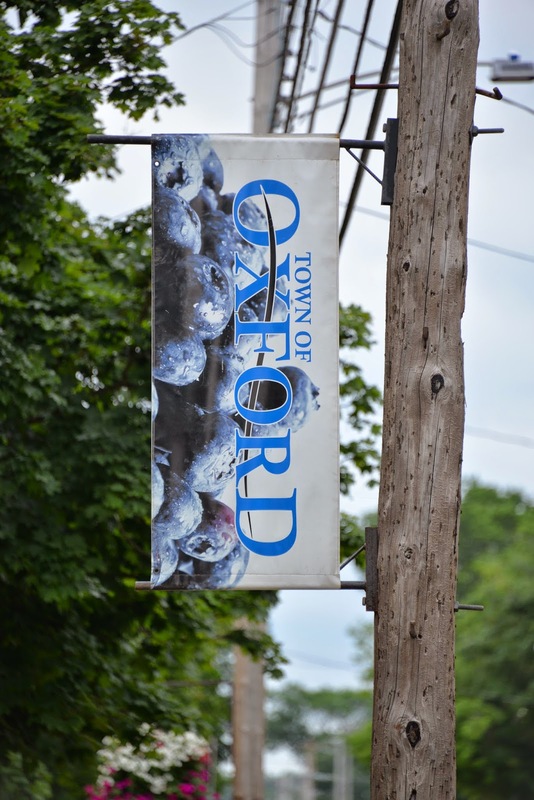 If you've purchased wild frozen blueberries from the grocery store, it's likely you've eaten blueberries grown in the Oxford area, or if not Oxford, from one of the many areas that provides wild blueberries to Oxford Frozen Foods. Oxford Town Hall. There is faint carving in the stone above the windows that reads "The Wild Blueberry and Maple Centre"
This building was once the local hardware store owned by my Grandfather Wood. My Dad and his family lived upstairs. There used to be a balcony on this corner of the building. In his childhood my Dad slept there on hot summer nights.